Fight MS with Food - Elizabeth Yarnell, naturopathic doctor specializing in food sensitivities (MRT, CLT), health, diet and nutrition speaker. The Fight MS with Food project exists to explore the link between undiagnosed food and chemical sensitivities and multiple sclerosis. It has since been expanded to include all autoimmune disorders. While current medical research focuses on finding a magic drug to cure MS, this new approach theorizes that by avoiding the immune response caused by Type IV hypersensitivity reactions to certain foods, MS sufferers will be able to avoid triggering the debilitating MS symptoms caused by aberrant immune responses. 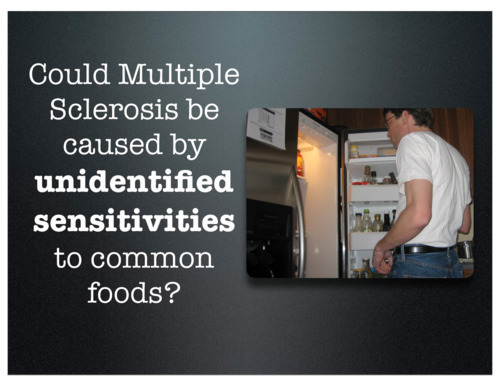 Watch the Fight MS with Food video below to learn more! MS patients enrolled in the program will receive blood testing to determine food sensitivities, along with personal dietary management and customized menus and recipes. The goal is to collect statistical data as to the efficacy and validity of the theory and program while giving enrolled MS patients immediate relief from symptoms and a decrease in inflammatory activity. The Fight MS with Food program requires self-funding. Geographic location is not an obstacle to joining the project; the only restriction being the ability to send a FedEx package overnight to Florida. To learn if you are an appropriate candidate to enroll in the Fight MS with Food project, use the Contact link above to send me an email. Want to know more about the theory behind the connection between autoimmunity and diet?